… it’s time to put them together in a new way. Nothing ever lasts forever. NOTHING. Things only fall apart when it is time to create something new and something much better suited for you. You can only hold onto what is not working for you for so long before the universe will take it away from you so that you can re-create a much better situation for yourself. Sometimes we cannot see and understand what that better vision is for ourselves. We get trapped in believing that if something falls apart on us that we are somehow being punished and that we are victims trapped in the drama. Instead of making positive change, we end up dwelling in the sadness of the loss and the pain and confusion of the drama. Sometimes we stay there for a very long time mourning the past, but that is NOT where you are supposed to be. The real work is in the understanding that you are never a victim of your life. You are always the master and when you can see and understand that things only fall apart to help you create a better vision for yourself, you will begin to understand how the universe works with you to help you to manifest your dreams. You always have a choice. You can either sit on the ground and feel sorry for yourself for losing what was not working for you OR you can get busy excitedly putting together a new plan for yourself that will better fit your needs. When you learn the simple laws of the universe, you begin to better understand your life. You begin to learn that when something falls apart, it is an indication that it WAS NOT WORKING ANYMORE and now you have a chance to find something that will work. 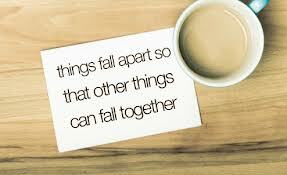 When things fall apart, your work is to make your life better because of it. End of story. There really is no other choice involved. Get excited the next time your life falls apart.